David Thomson is a British-born, U.S.-resident film critic best known for his A Biographical Dictionary of Film . To declare a bias, that volume—in its most recent, 2004 edition—is probably my most-thumbed movie reference: it’s wide-ranging, epigrammatic, ornery, and I disagree with it well over half the time. Thomson also writes for newspapers, gives lectures, and produces the occasional novel, such as Suspects . The book originally came out in 1985, and was reprinted recently by the British No Exit Press with a new introduction by Thomson. I give all this factual detail up front because, as will become apparent, Suspects is the sort of book whose nature and generic location are especially difficult to fix. (However the author, as will also become apparent, has no such difficulties; and he receives an entry in the Clute/Nicholls Encyclopedia of Science Fiction (1993) largely on the strength of this book.) Let’s just say, for the moment, that I think Suspects might be of interest to readers of Strange Horizons . The body of the book consists of brief biographical sketches of a number of movie characters, outlining their lives beyond the bounds of the films we know them from. The films are almost all U.S.-set and -made, and most are from the period between 1940 and 1980. So, for instance, in the first entry we learn about Jake Gittes—Jack Nicholson in Roman Polanski’s Chinatown (1974). He was born in 1901 in a whorehouse on Stockton Street, San Francisco, where his mother worked. After her death in the great earthquake of 1906, he grew up in an orphanage in Sacramento, where he gained his reputation as "a dark schemer, a promising middleweight, and the chronic teller of tall stories" (p. 1). The events of the movie itself are narrated tersely, as if from a distance, and the entry then continues, "for a year he did not leave his Los Feliz apartment—a victim of hepatitis and melancholy" (p. 2). The next entry covers the monstrous Noah Cross—John Huston in the same film—but it rather archly begins by saying that, "What follows can be no more than notes waiting for the publication of Gore Vidal’s biography of Cross, so often announced and postponed, yet still promised as Noah’s Flood: The Wealth of America " (pp. 3-4). Cross, we’re told, eventually died "early on the morning of June 18, 1972, in Ireland, of a massive heart attack, while on the phone to Washington D.C." (p. 6). That date—the day after the Watergate burglaries—and the hint that Cross might somehow have been a puppet master in that scandal are very characteristic of the way Suspects knits together America’s real and shadow histories. As the book progresses, a couple of things become apparent. First, that the person writing the entries is himself a specific movie character, with a stake in the histories he describes. (Saying which character would be the worst kind of spoiler.) Second, that the histories are intertwined, both with each other and with the history of the world. So, for instance, Julian Kay (Richard Gere in American Gigolo (1980)) is revealed almost casually to be the son of Joe Gillis and Norma Desmond from Sunset Boulevard (1950). Ilsa Lund (Ingrid Bergman in Casablanca (1942)) winds up as personal assistant to the U.N. Secretary-General Dag Hammarskjöld and dies in the same plane crash that kills him. And the narrator—as I say, a movie character himself—clearly watches the movies, wondering whether he bears a greater resemblance to Harry Dean Stanton in Paris, Texas or James Stewart in Harvey . A question occurs at this point. In the vocabulary we tend to employ round these parts, is Suspects not in fact a hugely elaborate work of fanfiction? In a sense, yes. It’s plainly built on enthusiasm for the movies, and results from a desire to peer beyond the edges of the stories they bestow. (And to subvert them, among other things.) But the author makes clear that he has other labels in mind. 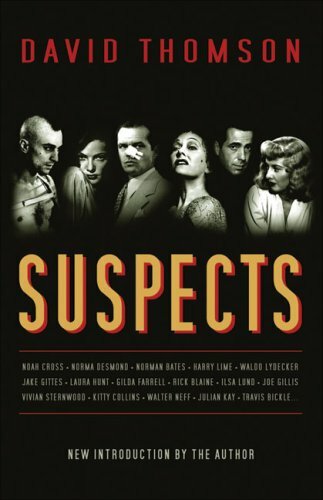 In his new introduction, Thomson explains that Suspects is an essay in the one movie genre, film noir, that "meant the most to me" (p. vii). Hence the centrality of Chinatown , that great essay in noir as the founding myth of both twentieth century America in general and Los Angeles (and so Hollywood) in particular. But Thomson sees the characteristics of noir as being far wider than just stories of "anti-heroes, femmes fatales, moody, would-be suicides, and that alienation that comes from urban life " (p. ix). Instead, he argues, "Noir ... grew out of the image and the age, a deliberate study in shadows and light, of course, but a response to the concentration camps, to the discovery of torture, and to the brave new world of Hiroshima" (p. ix). For him, Citizen Kane is a noir, as is Letter from an Unknown Woman ; and so—bookending Suspects in the same way that Chinatown does—is It’s a Wonderful Life . Capra’s fantasy of redemption may seem a long way from Chandler- and Hammett-derived detective stories. Thomson’s argument is that it’s a noir in the same sense as the line in the Klute essay about how close we are to the gutter. George Bailey’s glimpse into the abyss of a failed life is subject to the same gravitational pull. But accepting this thesis about noir is not necessary for Suspects to work for the reader. Nor is it necessary to know all the movies Thomson refers to. (My strike rate was about a half.) The book is at its occasional weakest with characters, like Jay Gatsby or Norman Bates, whose backstory is already pretty clear. The intricate harshness of Thomson’s imagination is most fruitful when he’s describing characters who are somewhat monstrous but whose stories are hazy in the source works. So the pieces on Noah Cross, Travis Bickle, and indeed George Bailey are among the strongest here. But this is a work whose power is incremental, whose shadow-America is elaborated step by step. The closest comparison I can think of are the fabulations of Steve Erickson—also obsessed with Hollywood and the myths its country makes about itself. But Erickson’s nightmares at least look like they’re couched as orthodox narratives. Suspects has scarcely any narrative at all, but its formal experimentation is entirely in service to its aesthetic ends. Its vision has limitations, but they’re limitations by design. If it only tells us about Hollywood and its dreams, that’s because they’re our dreams too.